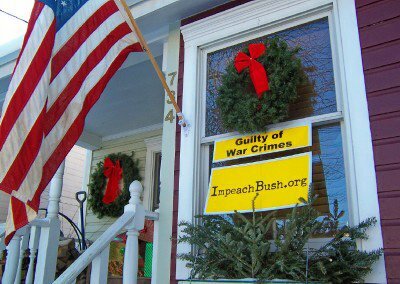 Patriotic People CARE: CO-OPTING Merry Christmas by the BAH HUMBUG Party! CO-OPTING Merry Christmas by the BAH HUMBUG Party! There is no war on Christmas but the far-right/repubs have succeeded once aain in making the 'dem/lib' side (when their is no side to this issue actually) play defense in another game of their dirty dodge ball. Remeber - "framing" -those of you who have read the George Lakoff's "Don't Think of an Elephant" (see above link for more useful information) this is another case of the far right using-actually trying to Co-Opt Christmas. I find my self almost compelled to call my beautifully decorated now inspite of having fallen over CHRISTMAS tree a Holiday tree, funny I never did before. What changed? I often said Merry Christmas and send out a variety of Christmas Cards- Season Greetings often to non-christian friends, and occasionally eveyone- just based on what struck my fancy. I have a manger and am not anti-manger- although sympathetic to the issue. I'm for reasonable inclusion of traditional, classical and especially fun songs Christmas/ Holiday /Seasonal songs. charity; compassion, concern, caring and courage. No one has a right to try to co-opt those VALUES, although they are of course free to share, and many conservatives do of course. Not IMHO the ones who are actually declaring this 'war on Christmas' although some of their frightened followers do. the far right again is trying to arouse anger and mistrust, even hate. That seems to be what Christmas is to them - just another weapon in their perceptual mangement arsenal.